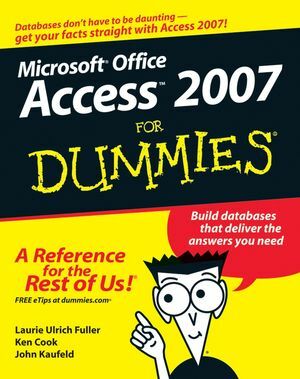 Laurie Ulrich Fuller has been writing about and teaching people to use Microsoft Office since the 1980’s. Her teaching career goes back to the time before Microsoft Windows – which means she also remembers the first time she taught people to use a Windows-based application, and a student picked up the mouse and aimed it at the computer screen as though using a TV remote. Nobody laughed (except Laurie, after class), because everyone was new to the mouse back then. As new as the mouse was, so was the idea of keeping a database on a computer that could fit on your desk — and Laurie’s been there through every new version of Access — as Office has evolved to meet the needs of users from all walks of life — from individuals to huge corporations, from growing business to non-profit organizations. Since those early days of Office and Windows, Laurie has personally trained more than 10,000 people to make better, more creative use of their computers, has written and co-written more than 25 nationally-published books on computers and software — including several titles on Microsoft Office. In the last few years, she’s also created two video training courses — one on Word 2003, and the other on the entire Office 2003 suite. She runs her own company, Limehat & Company, offering training, educational materials, and web development services. She invites you to contact her at laurie@limehat.com, and to visit her personal website, www.planetlaurie.com, for more information. Laurie would also like you to know that despite being able to remember the world before Windows, she does not remember a time before cars, television, or fire. Ken Cook has built and managed a successful computer consulting business since 1990 serving clients in New Jersey, New York, Pennsylvania, and California. He began as a trainer - training numerous users (too many to count!) on a variety of software packages — specializing in Microsoft Office. Currently, he “dabbles in training” but his main focus is creating expert Microsoft Office solutions and Microsoft Access database solutions for Fortune 500 and small business clients. He can be contacted through his Web site www.kcookpcbiz.com or email: ken@kcookpcbiz.com. John Kaufeld is a popular For Dummies author.